An “ace” Charity Golf Day with a shotgun start, 2 course meal and charity auction to round the day off. 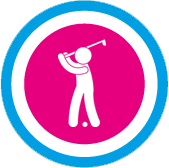 Tee off in aid of Hampshire and Isle of Wight Air Ambulance at the stunning Bramshaw Golf Club on Thursday 20th June 2019. The award-winning club is based in the New Forest, just 1 minute from junction 1 of the M27. Golfers can look forward to a spectacular day, beginning with tea/coffee on arrival, a shotgun start at 2pm, followed by a 2 course meal, charity auction and raffle finishing with the prize giving ceremony. Around the course, you can take part in different games including Beat the Pro and Closest to the Pin. Teams will take part in the day as a four-ball better ball and we’re encouraging entries from men, ladies or mixed teams. Team entry is £200 and this includes golf, refreshments, 2 course dinner and enjoyment. Enter today by downloading the form and returning it to Nicole in the charity team with a cheque. Please read the Terms and Conditions before returning the form. All money raised on the day will ensure the Air Ambulance Critical Care Teams can continue responding to those in need, across Hampshire and the Isle of Wight, day and night. The Manor Course was opened in 1971. Set amidst the beautiful New Forest in landscaped parkland of mature trees and 200 year old hardwood plantations, it is widely acknowledged to be amongst the finest and testing courses in the South of England. It is gently undulating, with excellent fairways and greens, and is a stern test for golfers of all abilities. Good shot selection is essential to shooting a good score! Your company can support our charity golf day. Find out how by contacting Nicole – nicole@hiowaa.org or call 02380 743510.